Who was the first black man to make an archaeological discovery? In 1900, 1,610 African Americans lived in New Mexico, many of them former slaves drawn to the wide-open spaces that promised self-determination and a respite from the early days of Jim Crow post-Reconstruction. We can surmise that the cowboy George McJunkin, like so many others (more than 1,000 of whom were men), headed west to find these opportunities, too. What McJunkin found, though, would transform our understanding of human history on the North American continent. Stories of McJunkin's early life vary but follow the same general route out of slavery and out of Texas. Born in 1851 in Midway, Texas, he became free at age 14 with the Civil War's end. He joined his first cattle drive at 17, which got him as far as Comanche. As a trail boss bound for Dodge City, Kansas, he left Texas for good. Along the way, he bought a pair of boots and became a cowboy. "He assisted the cook, learned to tell time by following the night stars, survived his first stampede," wrote Tricia Martineau Wagner. And, Wagner continued, "he outfitted himself to look like a real cowboy, purchasing a hat, pants, and a used saddle." He became known as an exceptional broncobuster and roper. In the 1880s he settled in New Mexico's Dry Cimarron Valley, where he eventually became foreman of the Crowfoot Ranch, supervising Mexicans (he spoke fluent Spanish) and white Americans. 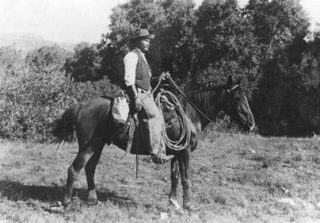 New Mexico's was not a colorblind society—many of his men called him "N—ger George" (probably harsher to our modern ears than to George's), and he had worked for a rancher, a former slave owner who didn't let McJunkin take meals with his family—but McJunkin attained a level of success unimaginable in the South. At some point on the trail, McJunkin had learned to read; it's said that he traded other cowboys horse-riding and horse-breaking lessons for reading lessons. He was known to be a voracious reader and avid collector of books and artifacts, with an unbridled passion for acquiring knowledge, particularly in the sciences. The amateur naturalist had exceptional carpentry skills and built a cabin to house himself and his findings. On Aug. 27, 1908, a flood nearly obliterated the nearby town of Folsom, N.M. As ranch foreman, once the storm passed, McJunkin thought he might find some broken fences (which he did), but in a huge gully created by the flood in an area called the Dead (or Wild) Horse Arroyo, he found something much more significant: bison bones far too big, buried far too deep, to belong to any animal alive. For many years he tried, and failed, to enlist acquaintances to come out to the "Bone Pit." He recognized the bones' significance but had no way to prove it. McJunkin died in January 1922, his suspicion of the tremendous importance of his discovery unconfirmed. Seven months after his death, two fellow hobbyists named Carl Schwacheim and Fred Howarth visited the bone site McJunkin had invited them to so many times before. Finally understanding the enormity of his discovery, they pursued their friend's quest. It would be four years before the site was formally excavated by archaeologists from the Colorado Museum of Natural History. The remains the team unearthed allowed them to identify Bison antiquus, about twice the size of modern American bison and extinct for some 10,000 years. More incredible than the fossils themselves was the discovery of the spear point embedded between the bison's ribs: proof that humans had lived in North America much earlier than previously believed. As the historian Mary Germond put it, "McJunkin had come upon the kill site of Stone Age hunters gone more than 100 centuries." The weapon of choice of the ancient, heretofore unknown hunter was given the name Folsom point.